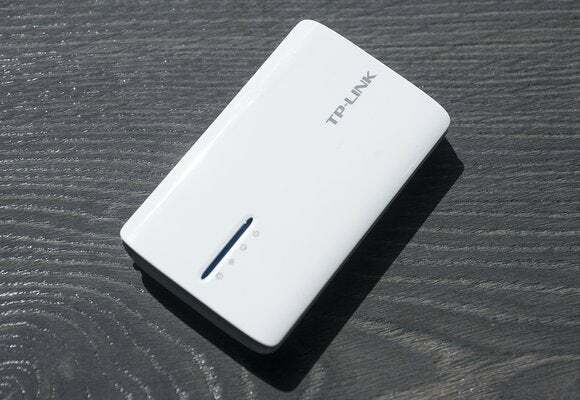 If you need to travel light, TP-Link’s TL-MR3040 is one of the smallest, lightest travel routers I’ve tested. It’s about one-third shorter than the D-Link DIR-510L and will fit easily in a shirt pocket. It can operate either on its included AC power adapter or its internal rechargeable battery. But much of the reason for this router’s diminutive dimensions is the size of its removable battery: It’s a 2000 mAh model, compared to the 4000 mAh battery in the D-Link. TP-Link’s router is compatible only with the 2.4GHz 802.11b/g/n standards, and it supports only one 150Mbps spatial stream when operating in 802.11n mode. 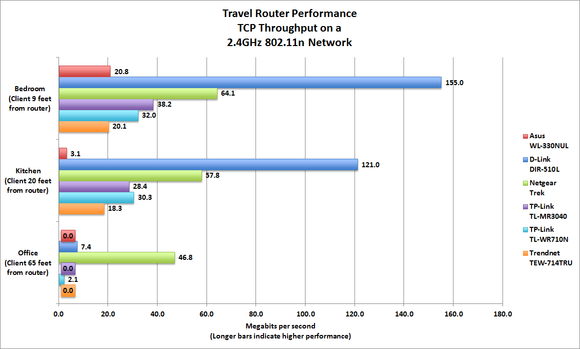 On those two counts, it falls behind both D-Link’s router (an 802.11ac travel router) and Netgear’s Trek (an 802.11n travel router that supports two 150Mbps spatial streams). The TL-MR3040 placed a distant third in terms of TCP throughput. The TL-MR3040 has a USB 2.0 Type A port whose sole purpose is to host a 3G cellular modem (models based on hardware version 2.0 can also support 4G and LTE modems). TP-Link made no provision for sharing files on an attached USB hard drive, so it’s not surprising that it doesn’t have a DLNA media server. The router has a mini USB port for running on AC power and charging the battery. The TL-MR3040 has a single ethernet jack that can function as either a WAN or LAN port, depending on which mode the router is operating in. TP-Link’s router can operate in one of four modes: As a mobile router (using a 3G adapter and subscription service you provide), or as a WISP (Wireless Internet Service Provider) client. In these two modes, its Ethernet port can service a single hardwired client (or many hardwired clients if connected to a switch). The TL-MR3040’s other two modes are a WAP (Wireless Access Point) hardwired to a network, or a wireless router hardwired to a DSL or cable modem. LEDs glow to indicate the power and battery, ethernet connection, Wi-Fi operation, and Internet connection. TP-Link's TL-MR3040 isn't a barn-burner, but it's first two throughput scores are respectable. In my tests, the TL-MR3040 placed a distant third in terms of TCP throughput—with throughput of 38Mbps—when the client was in the same room as the router, separated by about nine feet. When the client was in the kitchen—20 feet from the router and separated by one insulated wall—throughput dropped modestly to 28.4Mbps. But the router couldn’t reach the client at all when it was in my home office, 65 feet from the router and separated by several insulated walls. The TL-MR3040 supports nearly all the features and functions you’ll find in a conventional desktop router, including support for security up to WPA/WPA2 Enterprise with a RADIUS server. Yet it doesn’t have a WPS button or even WPS support in software. It also does not have a guest network so you can share your Internet connection with guests while restricting them from the rest of your network. This router has a few limitations, but portability isn’t one of them.